Whoever took this picture wasn’t used to taking mug shots – an inexperienced operator, unfamiliar with the layout of the room and the workings of the equipment, left alone to process a prisoner of little importance who had been charged with larceny, which is to say, shoplifting or stealing a bicycle or picking someone’s pocket. The photograph was taken on 21 April, 1948, and none of the experienced officers would have wanted to waste time booking Earl. That day, every policeman in the city was out looking for the men who had broken into the Best Foods warehouse on Long Avenue around one o’clock that morning, removed the two hundred and twenty-five pound safe and transported it to a lonely road near Cascade park, where they forced it open and stole the $720 that it contained. The busted shell was found later by two small boys passing by on their way to school. The thieves were never caught. The Best Foods company closed down years ago. The money is long since spent. 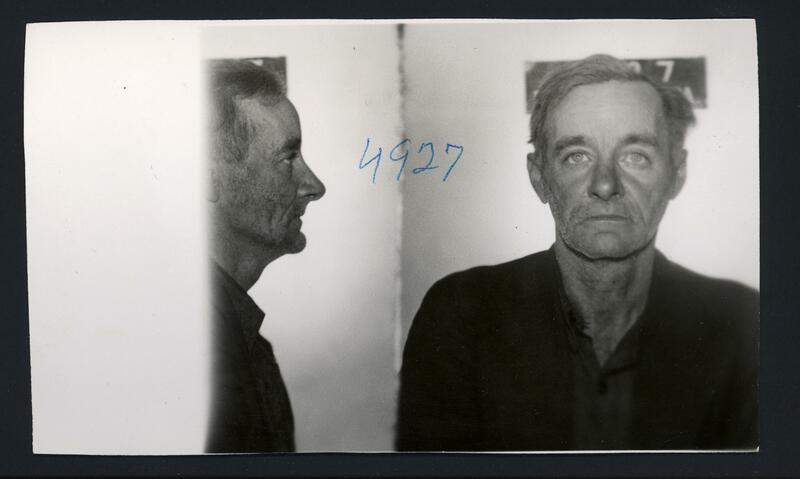 The only remaining evidence of the robbery is this botched mug shot of Earl Bryan, who had nothing whatsoever to do with it. Sources: New Castle News, 21 April 1948, “Safe Is Stolen; Yeggs Get $720”. Short, pithy, and somehow comical. I love it! Sometimes life offers clumsy surprises, flawed and inadequate like the rest of us.